A phlebotomist is a person that is trained to draw blood from a patient. 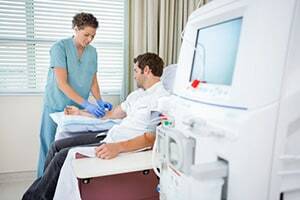 They work in hospitals, medical and diagnostic labs, blood donor centers, and doctor's offices. Phlebotomists are supervised by another medical professional. Phlebotomists can get a phlebotomy certificate in 6 months to one year. Qualifications vary by state. The drawing of blood is a frequent, common procedure in medical practices. Normally, no serious injuries occur. However, if blood is drawn improperly, it could lead to severe injuries. The most critical injury concerns the nerves, which can leave patients with life-lasting effects. These can include swelling, numbness, loss of function, and can require surgeries to correct. A patient could also develop post-tourniquet Syndrome. This is a prolonged swelling of an extremity, usually caused by blood returning to the area after the phlebotomist releases the tourniquet. If your symptoms continue for a few days, it is important to seek prompt medical attention to help limit the chronic pain and nerve damage. The leitmotif in many successful phlebotomy malpractice lawsuits that end in settlement or verdict is that the phlebotomist should have used the median cubital vein but, for whatever reason (usually convenience) chose another path. Another common theme is the phlebotomist who makes too many collection attempts. After two failed attempts, another phlebotomist or preferably a supervisor is asked to intercede and be consulted in the collection attempt. The standard of care is that a phlebotomist should not try more than two collection attempts on any patient. The standard of care also requires that the phlebotomist insert the needle with a clean stick into the vein. A “clean stick” is defined as one smooth be poking or prodding and entering the vein without penetrating through it, under or around it. The phlebotomist should not be probing or digging around in the patient's arm trying to get in an IV or getting a blood sample. Below is a list of some sample verdicts and settlements from recent cases. You can use sample settlement and verdicts as a guide in figuring out what possible outcomes could be in your case if it is successful. That said, it is just one piece of the puzzle of understanding the settlement or verdict range of your case. You can look at an analysis of a Baltimore, Maryland phlebotomy lawsuit here. 2015, Oregon: $537,176 Verdict. An adult female is having her blood drawn at Providence Health & Services. She complains of pain after the needle is inserted, and asks the phlebotomist to stop. The phlebotomist continues drawing blood even when the plaintiff experiences shooting pain in her arm. She even tries to move the needle around to draw more blood. The phlebotomist never contacts a nurse or doctor for assistance. As a result, the woman suffers a permanent nerve injury to her cutaneous nerve in her left arm, resulting in the need for surgery. A jury awards her $537,176. 2015, Connecticut:$140,000 Verdict. A 39-year old male is having his blood drawn by a phlebotomist at Quest Diagnostics, when allegedly the phlebotomist inserts the needle at an angle more than 30 degrees, too deep, and fails to withdraw the needle. The patient complains of excessive pain, but the phlebotomist continues to draw blood. As a result, the man suffers injuries to his left superficial radial nerve and left antebrachial cutaneous nerve, complex regional pain syndrome, depression, and emotional distress. A jury awards the man $11,180 for past medical expenses, $100,000 for future medical expenses, and $28,820 for non-economic damages. 2010, Texas:$703,068.00 Verdict. An adult female goes to Clinical Pathology Laboratories to have blood drawn from her right arm. The phlebotomist negligently inserts the needle, causing a nerve injury to her arm, which progresses to show signs of Complex Regional Pain Syndrome. A jury awards her $112,000 for past physical pain and suffering, $113,000 for future pain, $84,361 for past medical expenses, and $243,707 for future medical expenses. A judge then orders the plaintiff to recover pre and post-judgment interest. 2008, California:$959,700 Arbitration Award. A minor female goes to Kaiser Foundation Hospital for a routine venipuncture. The phlebotomist inserts a needle into her vein at an angle exceeding the maximum standard of care by between five and 15 degrees. This results in a deep needle stick to her right median nerve in the right cubital fossa. The woman suffers residual pain, and will likely require surgery in the future. Although the defendant alleges that the angle recommendation is a guideline, not a standard, and a defense expert claims that the plaintiff should have been symptom-free after a year of the incident, the arbitrator awards her $959,700. 2005, Colorado:$556,036.00 Verdict. An adult male goes to the Diagnostic Center of North Colorado Medical Center for a routine blood draw. The phlebotomist begins to have difficulty drawing blood from his arm. After three or four attempts, the phlebotomist allegedly "digs" the needle into the plaintiff's arm, resulting in extreme pain and numbness. The man suffers a hematoma for several weeks, followed by permanent neurological damage to the nerves in his arm, and dysesthesia and paresthesia causing pain, discomfort, numbness, tingling, and loss of function. The defendant denies the allegations and claims that the injuries were due to either pre-existing conditions or the failure to follow his physician's advice. A jury awards the plaintiff $556,036. 2005, Kentucky:$154,000 Verdict. An 80-year-old female is having her blood drawn at the hospital. The phlebotomist who is drawing her blood places a tourniquet on her arm and leaves her for 10 minutes, resulting in nerve damage. A jury awards the woman $154,000, but this is later reduced to $100,100 as the judge found comparative negligence of 35%. 2000, Pennsylvania:$205,000 Verdict. An adult male is required to have a physical exam by his insurance company. He has his blood drawn by a phlebotomist, and he subsequently suffers strep infection. He alleges that the phlebotomist failed to properly draw the blood and failed to take the appropriate protective measures to prevent an infection. The defendants deny liability, but a jury awards the man $205,000. 2000, New Jersey:$100,000 Verdict. A female in her 40's is having her blood drawn when the phlebotomist punctures the median nerve when drawing her blood. She claims that she will suffer pain, numbness, and tingling in the future. She brings a claim against the phlebotomist and hospital, alleging the improper training and experience. The defense argues that the experience was adequate, she was properly supervised, and that plaintiff suffered a known risk occurring without any negligence. If you or a loved one has suffered serious side effects and deaths caused by a mistake of a phlebotomist in Maryland or the District of Columbia, call us today at 800-553-8082 or get a free, no-obligation online case review.